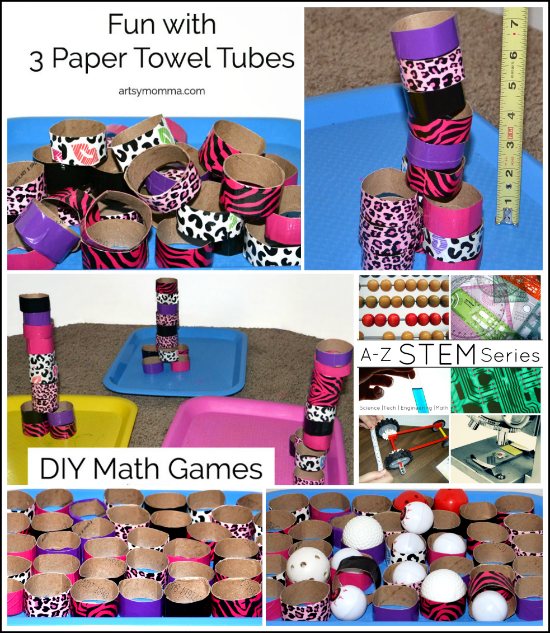 We had 3 paper towel tubes that I wanted to incorporate into some kind of stacking or learning game. 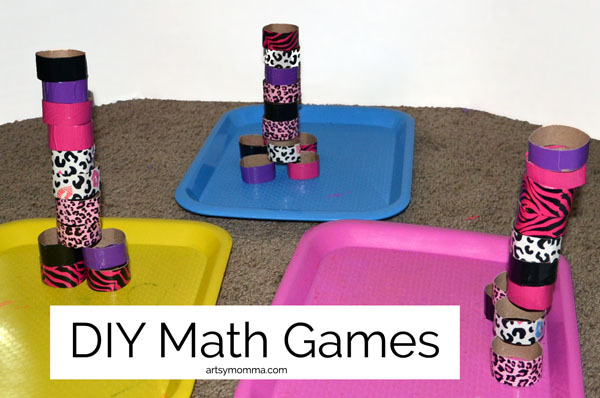 I ended up turning the into 2 different DIY Math Games – tallest tower and toss-n-tally. The math games involved counting, measuring, and adding. 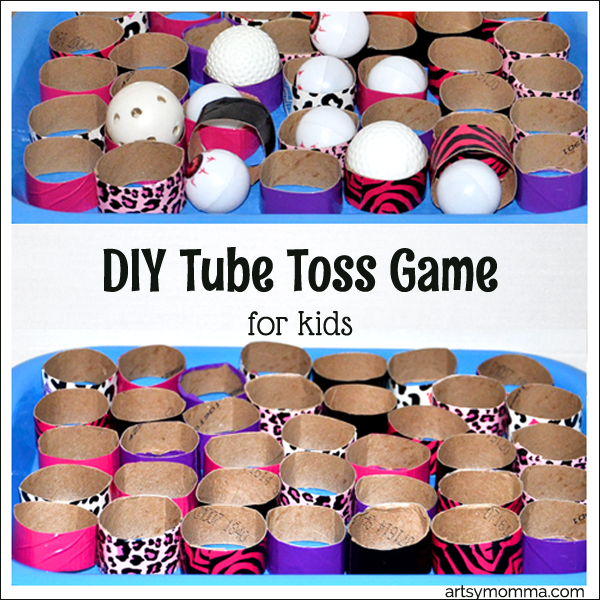 Wrap Duck Tape around the cardboard tubes. We have a bit of a Duck Tape obsession so I used 6 different colors/patterns total. 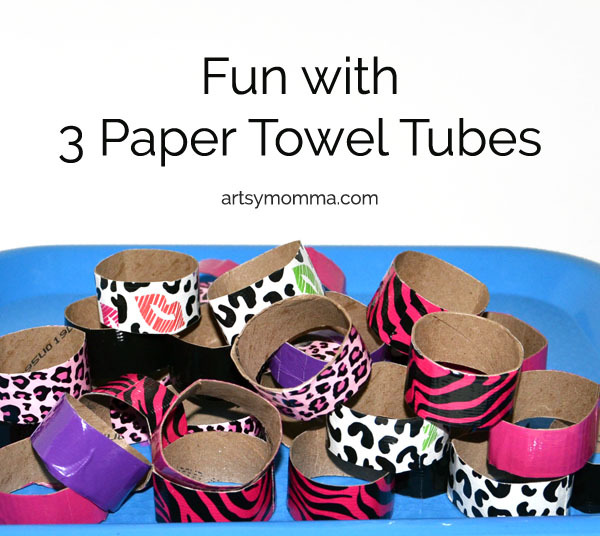 Since we used so many, I cut all 3 paper towel tubes in half and then covered each with a different design. Since each section used about 3 strips of the Duck Tape, I cut them where the strips met. So each of the 6 sections were cut into thirds. Then I cut those in half. I ended up with 36 stacking rings total – 6 of each pattern/color. 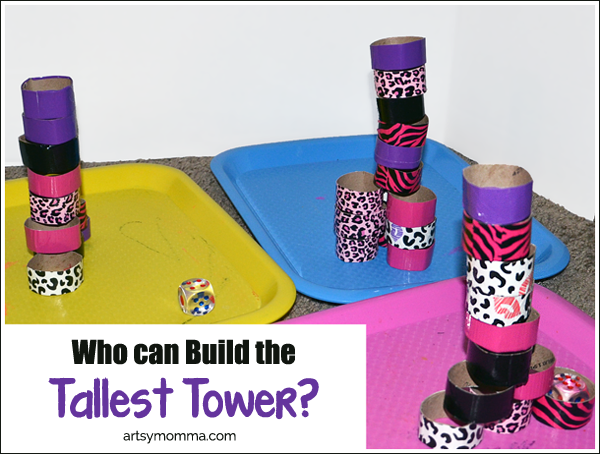 Instead of using Duck Tape, the kids may enjoy painting the tubes or creating their own designs with markers. Covering with construction paper would also work. For this game we used our craft trays from Oriental Trading Co. Any smooth surface would work like a table or book. Give each player the same amount of stacking rings. The 3 of us had 12 each. The challenge was to make a tower with the tallest one being the winner. We played two different ways. First, we took turns rolling a dice to collect cardboard rings. Each of us collected whatever number we rolled until all were gone. Then, we had to build the tallest tower using the rings we had collected. They both loved doing this! After they were all built, we measured how tall each was using a measuring tape. this also makes a great way to learn how to read a measuring tape. For the second game, we all got the same amount of rings and then had to build the tallest tower. We all guessed who had won. We each had 12 cardboard rings. Both kids had a blast with this game and played it several times during the week. My son begged me everyday to play it with him every day! We placed all the rings in a single layer on one of our craft trays. I had the kids gather all the ping pong and golf balls we had. My son wrote our 3 names in three separate columns. Big Brother just started learning how to use tally marks this past year. This game made great practice for him to count by 5’s and keeping score using this system. The next day, my son and I played a game will Little Sister was sleeping. We played 5 rounds total. After the fifth round, we rolled one of the dice for extra balls to throw. 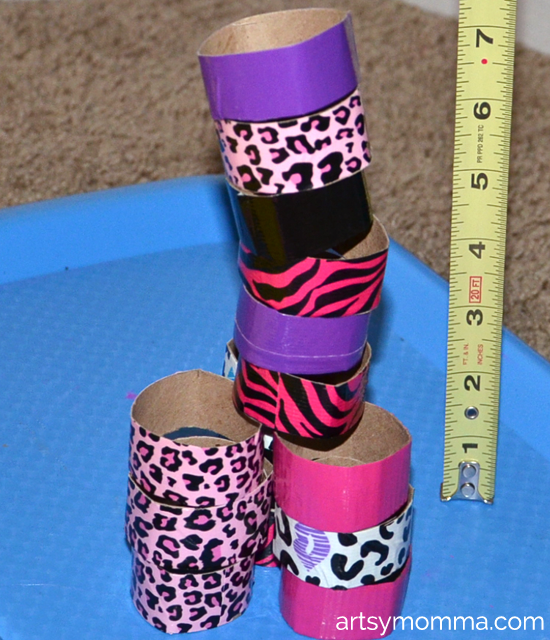 I’m sure we’ll find even more uses for these cardboard tube rings made from Duck Tape! How would you use them? 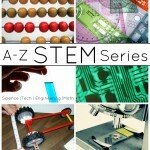 This post is part of the A-Z STEM Series (Science, Technology, Engineering, and Math) for Kids. Throughout the month of January, a huge group of kid bloggers will be sharing multiple STEM activities for all the letters of the alphabet. See the whole STEM activities series here. We also shared constellation crafts and activities for the letter C that you also might enjoy. « Plastic Bottle Minion Craft – Store markers in it!